Many times we see on social media fans talking about wrestlers who should have been the World Heavyweight Champion. I've even written a blog or two about it myself. But tag teams are never really brought into the conversation. 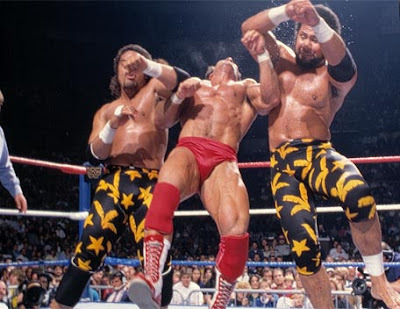 Here are three tag teams who should have won the WWF Tag Team Championship. 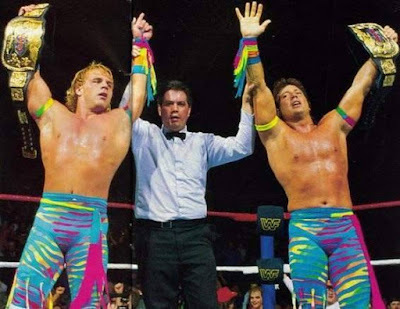 The Rockers technically beat the Hart Foundation for the belts in the fall of 1990. However, there were issues with the ring that night and the footage never aired on TV. Back then there was a saying if it didn't happen on TV, it didn't happen, so Shawn Michaels and Marty Jannetty were never recognized as the champs. I always enjoyed the duo and was disappointed when they split them up. We all know Michaels went on to have an amazing solo career and also won the tag titles with various partners, including Diesel, Steve Austin and Triple H. Jannetty and The 1-2-3 Kid had a brief run as champions too. Paul Roma and Jim Powers were both "enhancement talent" in the mid-1980s. But then in 1987, the two caught fire and The Young Stallions started climbing the tag team ranks. The two joined the Killer Bees as the survivors of the tag team match at the first Survivor Series. They seemed to be the perfect underdog duo and destined to eventually win the gold after years of toiling. Imagine had they beat the Hart Foundation for the belts in '87 instead of Strike Force. Not knocking Rick Martel or Tito Santana, but the angle could have gone very similarly with Roma turning heel and becoming the Model. Again, no knock to Martel who did extraordinary in that role. The Islanders were a solid babyface team in the 80s. Then one day they joined forces with Bobby "The Brain" Heenan. The trio worked well together as Haku and Tama put their years of experience to good work. Haku would eventually win the belts with Andre the Giant. The Islanders could have been The Brain's first champs, but it wasn't meant to be. I realize putting the titles on any of these teams would have disrupted the history of the WWF. But it would have been nice to see these three hard working teams be rewarded for their skills. Well said ! Whoever does effort should be equally rewarded but wrestling is quite different so it gets tough to decide who the real hero is.